Cocktails and Daydreams | Edinburgh Lifestyle Blog: Quick Tip - Topshop Alvin Dupes for under £30! Another quick tip post from me! 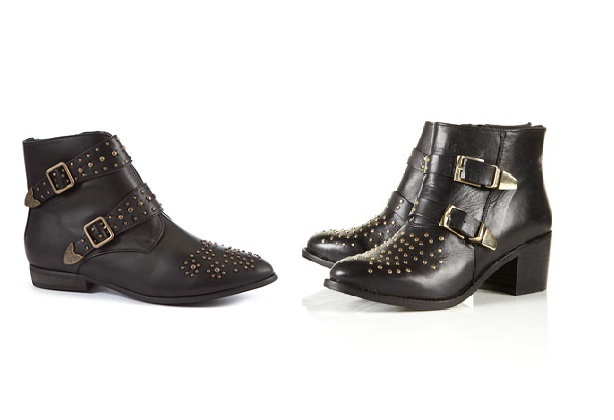 You've probably already seen that New Look are selling a close dupe for the popular Topshop Alvin Boots. Well I noticed today that they are currently on sale for just £26.24 (was £34.99)! The boots seem to be a bit of cult product amongst fashion bloggers (you can see the gorgeous Llymlrs wearing them here), and I have to admit I've well and truly been sucked in by the hype - they just look so wearable and would go with pretty much everything! It looks like they still have them in stock in all sizes on the website, but I imagine they'll probably sell out fairly fast so if you fancy a pair you best be quick! The new look ones actually look nicer!